Looking for a great developer that offers a wide range of great restaurant themes and templates for various platforms? Well then, DX Themes is exactly what you need. These guys don’t only create WordPress restaurant themes and stop at that. No sir, they also have Joomla restaurant templates! Actually, no matter what your favorite website creation system is, DXThemes have it covered. Did I say they have HTML restaurant templates as well? Yes they do, and you are going to love them all so much you won’t be able to choose your favorite one! All of their themes and templates are created to be super user friendly so you can do all kinds of stuff around the website all by yourself. A wonderful, easy to use drag & drop admin panel is featured on each and every theme, and it is specially made for users with minimal skills. You no longer have to be a professional to have your website up and running. This system is very easy and intuitive, everything will be clear to you and you will be able to edit and adjust your website to fit your needs perfectly. If you want a theme or a template you can create easily and quickly with the ending result being a professional, beautiful website for your restaurant, this developer will make this happen for you. Detailed step by step video tutorials are available, and they are very sharp and understandable. You will be playing web developer in no time, with seriously good results. Why bother finding a web designer to do this for you, when you can have the work done by yourself? 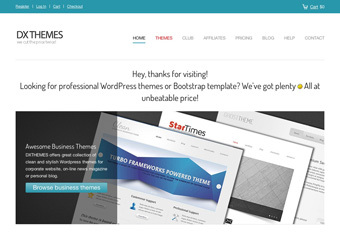 DX Themes helps their theme users with awesome customer support and great community forums that will help you with your website any time you need them to.